Just about every campus around the country has spooky stories that surface around Halloween. Underground tunnels where alumni ghosts have been hiding for centuries, hauntings in dorm bedrooms from old spirits, and creepy roommates who had meltdowns after failing finals – never to be seen again. Although scary stories are fun to hear this time of year, there are some frightening things that happen in dorms every day. And although they have nothing to do with ghosts, they can send you screaming in fear. 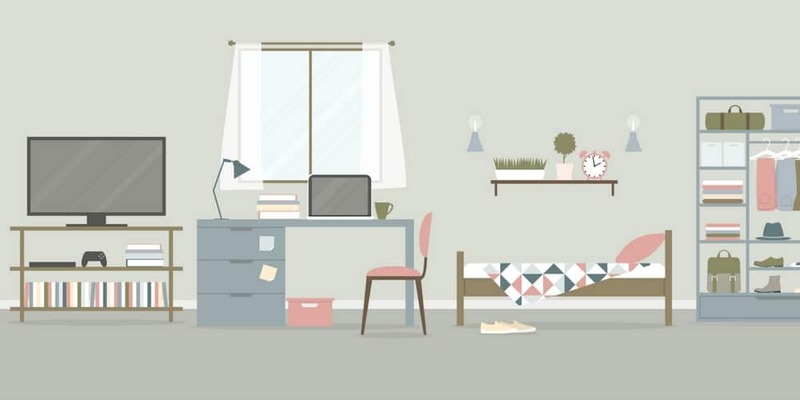 Your dorm bedroom can be the perfect place for any of these bugs to make themselves at home. The only way to avoid a nasty insect infestation is to keep your living space clean. Spiders are attracted to moisture, light, and clutter. They love to make webs in the corner of your dorm bedroom, in windows, and even in a stack of papers you leave lying around. To prevent spiders, get rid of clutter where they can hide, and when you do find them, vacuum them and their webs. These small brown or silver bugs have lots of legs and move like fish – so gross!! They like moist areas and will feast on your school books. If you’re living with a roommate, remind them to hang up wet towels and clothes, so these nasty critters aren’t attracted to your room. The word “roach” itself can make you shudder, and once you start seeing them, they can be hard to get rid of. These disgusting bugs are drawn to food and will breed in the trash, so don’t leave snacks out. Instead, store food in airtight containers and empty your trash often. These itty-bitty insects can survive in a college mattress or bed frame for months without food and then feast on you once you move in. Be sure to check the seams of your mattress along with as any cracks, nooks or other hiding spots, and consider buying a bedbug-proof mattress pad. If you see any signs of these pests in your dorm bed make sure to tell your R.A. If you took a microscope to your dorm bedroom, you’d be disgusted at what you’d find. Living with a roommate means you have twice the germs as you ever did in your bedroom at home and a lot higher chance of becoming ill.
Did you know, that germs can live on doorknobs for more than two hours… So, if you count how many visitors come in and out of your dorm bedroom, that’s a lot of germs waiting to make you sick. Make sure to put Lysol on your dorm room checklist and spray your doorknob often. Also, be sure to wash your hands regularly and have hand sanitizer on hand. In a University of Virginia study, 50% of television remotes tested positive for rhinovirus and a bunch of other germs. If you have a TV in your dorm bedroom, wipe your remote down regularly with sanitizing wipes. Think about all the nasty food that’s exploded in your microwave and all the salmonella and Escherichia coli (E. coli) that could be lurking on its handle. Yuck! To keep from getting sick, wipe down the outside of the microwave with an antibacterial cleaner, and clean the inside often with soap and hot water. Fungus Among Us study, Dr. Lisa Shives found a college senior’s pillow had 170 million potential bacteria counts, and almost 40 million potential yeast and mold counts. These included shigella, which is known to cause dysentery, and Cladosporium molds, which can lead to skin lesions, asthma, and pulmonary infections. 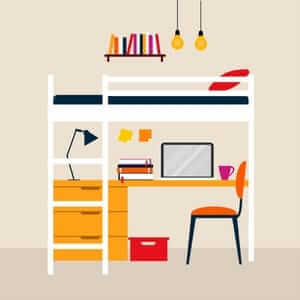 The best way to avoid the nastiness that could be lurking in your college mattress is by washing your sheets and pillowcase and by using a mattress pad and pillow protector. You can’t do much about the scary ghost stories you hear around campus – except maybe sleeping with the light on for a while. But you can do something about keeping bugs and germs out of your room and away from your college mattress. Bottom Layer: Cotton-Blend FabricWith soft silky bamboo and Jooma wool, you can kiss your nightmares goodbye and drift into a deep, comfy sleep. To do your best in class, you need a good night’s sleep, right? Find out more about DormTopper now.